When the Invisible Children/Kony video went viral, it once again highlighted the fact that, when it comes to charities, helping people is just one of many aspects we consider when we decide whether or not to open our wallets. Giving is an inherently emotional act, but it also allows us to rank ourselves against others. Being hip to an emerging phenomenon in today's media-saturated world is something else that influences us. And of course, everyone likes to consider themselves sophisticated and immune to being scammed. 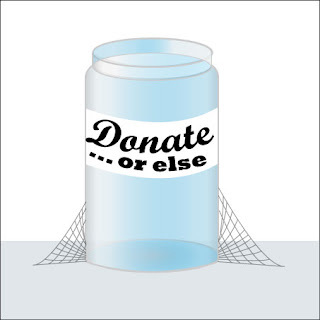 Unfortunately, charities and scams go hand-in-hand. For example, the debate continues to rage about whether street beggars in some parts of the world are controlled by the mafia. One side says yes, and claims many beggars pull in a decent amount of money every month. The other side says; perhaps that is partly true some of the time, but it is more of an urban myth that makes it easier not to give. Controversy often surrounds giving, even in the workplace. It is very common nowadays for companies of all sizes to align themselves with an official charity. This accomplishes a number of things. First, it fulfills people's need to give and feel generous. But it also allows a company to be seen as generous and a good corporate citizen. While the workplace and charities have had a connection for years, it has become much more pronounced in recent years. Many charities have numerous people dedicated to creating and maintaining relationships with companies. Of course, the official charity that a company has a relationship with is not the only charity that has a presence in most workplaces. This is a good thing in many ways. After all, the result is that more money goes to more people who need it. But it also results in some interesting dynamics. A kind of competition exists for employees' charitable donations in the workplace. From the parents who send around emails asking for contributions for their sons or daughters school or sports-team related funding drive, to various individuals championing the cause that best complements the image they present to the world, it can often feel like a shakedown. Don't give and you are highlighted as a scrooge. Don't give enough and you are seen as cheap. In extreme situations, an employee who champions a certain charity in the workplace can make it personal. At an organization I briefly worked at, an official relationship was established with a local charity. The "privilege" of wearing casual clothes on Fridays was tied to the charity. In other words, if you wore casual clothes on a Friday, you were expected to put some money in the charity jar that was located in the kitchen. To some people—the ones who did all the organizing and interacted with the charity—this was non-negotiable. For others, it was something that they did on occasion, sometimes dumping their loose change in the jar, and other times putting in a five or ten dollar bill when they felt generous. I fell into the second category. While I never changed my attire for Fridays, I still liked the work that the charity was doing and donated once in a while. I was only working there on a short contract and had no other work prospects in sight, so I felt others would probably understand if they knew I wasn't coughing up every Friday. Then one Friday, a snarky email was sent around by one of the women who helped administer the collection of money for the charity. She questioned why donations were down. She emphasized the fact that when you wear casual clothes on Friday, you are entering into a tacit contract that means you must fulfill your end of the bargain and donate some money. She clearly thought that she was going to browbeat everyone into giving more. But it had such an inappropriate feel to it that I am sure that it had the opposite effect. From that point on, the charity seemed all about that person. I envisioned her talking to her contact at the charity and shamefully reporting the meager takings for the month. She probably had a list of other organizations who were also aligned with the charity and likely knew how much they were donating on a monthly basis. This is another way that charities increase donations—turn it into a kind of challenge to see who is the most generous. Another relatively recent trend is for individuals to announce to colleagues that they are involved with a specific charity. Often, the choice of charity is related to the individual plight of a family member or friend. If the end result is more awareness and more people receiving help, who can argue? Surely not the employer when approached by the individual who wants to make the pitch in the workplace. And once one person has the green light, it is impossible to deny others the right to publicize their favourite cause. While most people are tactful when soliciting support in the workplace, there can be some cringe-worthy exceptions. When the individual engages in an ongoing physical challenge (think: swimming a pre-determined number of miles) as part of the soliciting of donations, an email update might appear with every kilometre they run, or new milestone number of hotdogs they ram down their gullets. I can't help but think that they are conscious of who is giving the most. Won't this ultimately affect how they interact with their colleagues in the workplace? Here's an idea: next time you want to make a donation to a worthy cause, do some online research and find a decent charity that doesn't have a lot of overhead and doesn't pay an unacceptable percentage of their donations to salaries and other administrative costs. Then, make an anonymous donation to that charity and tell exactly no one about your act of kindness.